Something unusual happened around this time last year. A 25-year-old Pakistan Army soldier, Tariq Yunus, was kidnapped from Karachi’s Saddar area where he was shopping and was shot dead later. The police called his abduction and murder a “reaction to the killing” of a suspected Lyari gangster in an “encounter” — or a shootout. “First such incident in recent times,” proclaimed a police press release issued on September 15, 2014. It is not known if and how Yunus was linked to the “encounter” in which one Faraz, alias Chota Pathan, had died on September 11 last year. Yunus was certainly not among the officials involved in the reported shootout. At the time of the incident, he was not even posted in Karachi and was part of an army unit stationed in Hyderabad. As the police press release suggests, his assassination was a response to the role the Sindh Rangers and the army’s senior leadership have been playing in tackling law and order problems in Karachi — an eye for an eye, a murder for a murder, seems to be the message that the incident is conveying. Though similar attacks on army officials or rangers men are not reported to have occurred again over the last 12 months or so, there have been multiple attacks on police officials in the same period. In August 2015 alone, six policemen were killed in Karachi in what looked like incidents of targeted shooting. Mostly, if not entirely, these shootings are meant to avenge law enforcement operations in which people are rounded up and detained on an almost daily basis. While many of those held in such operations have become “missing persons”, others turn up dead after having been shot in what the police and the rangers claim to be exchanges of gunfire. 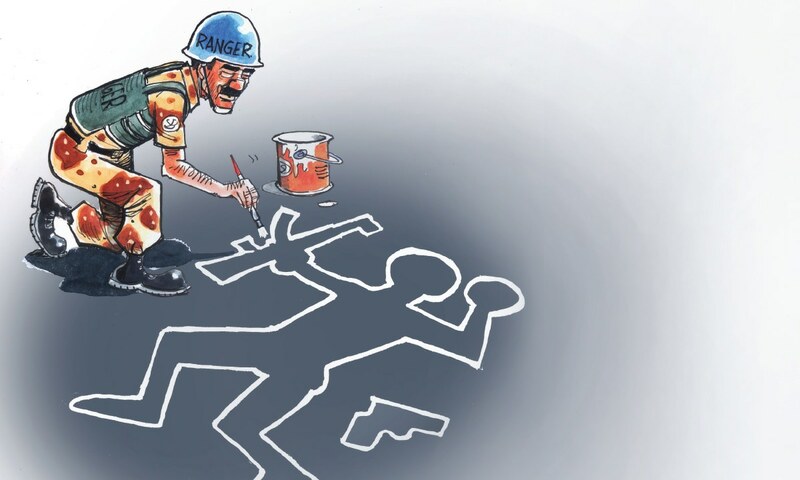 According to the statistics compiled by the Human Rights Commission of Pakistan (HRCP), such “encounters” have taken the lives of 404 people in Karachi in the first eight months of the current year. 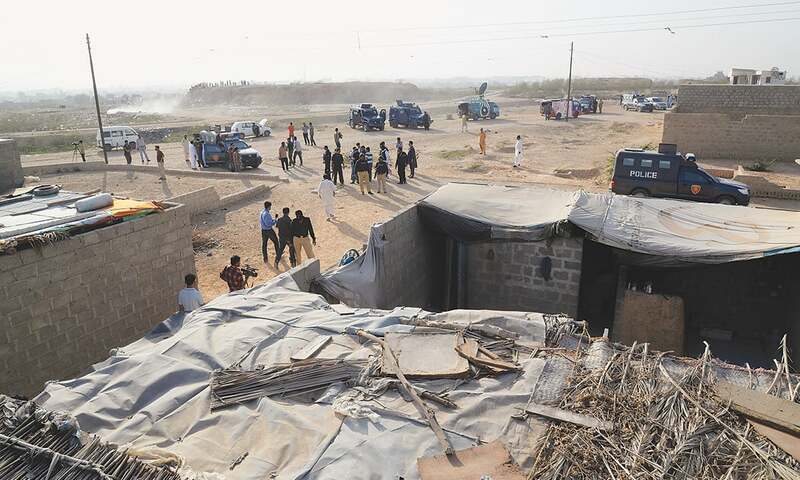 Most of these alleged encounters have taken place in a crescent-shaped area that links Baldia Town in Karachi’s west to Korangi in the east through Surjani Town and Malir, respectively in the northwest and northeast of the city centre. A report published in January-March 2015 issue of Pakistan Journal of Medicine and Dentistry (a quarterly academic journal published by Ziauddin University, Karachi) shows that the highest number of deaths in encounters between January 2011 and October 2014 took place in district Malir. Based on the official medical examination of 260 people killed in encounters during that period, the report notes that 44.23 per cent of them had died within the Malir district. 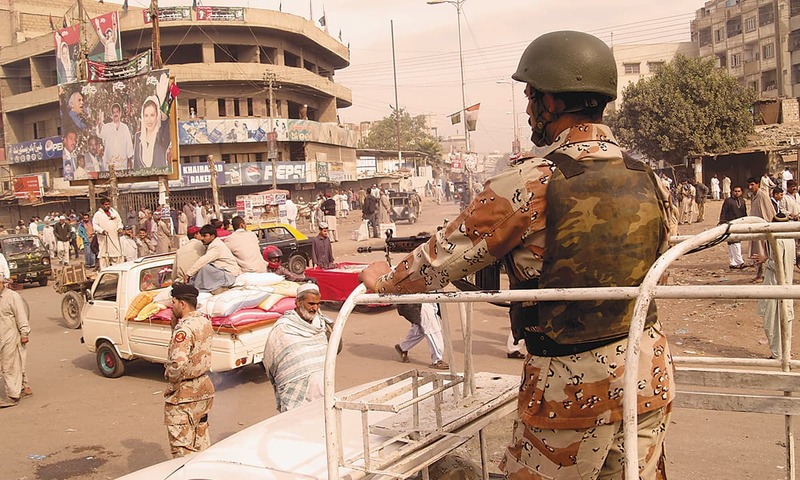 The second highest number of encounter killings – in the same period – was recorded in district South, which includes the crime-infested Lyari, closely followed by district East. Media reports suggest the geography of encounter killings has shifted in the last year or so. Most encounters now take place in areas along the Super Highway – that links Karachi with Hyderabad – and in the vicinity of the northern bypass road which connects the seaport with the Super Highway in a big arc running through the western and northern edges of the city. Most of the 57 kilometre-long northern bypass stretches across wilderness. Small villages and half-developed residential neighbourhoods are spread along its length, interspersed with sand dunes, low shrubs and vast empty spaces. This topography offers ideal locations to law enforcers to kill alleged criminals without being watched by curious human beings, allowing officials to claim the killings to have resulted from shootouts. That almost all these alleged encounters take place at night further diminishes the possibility of anyone having witnessed them first-hand — except, of course, those who do these killings. Many people living between Deedar Goth – at the northern fringe of Baldia Town – and Brohi Hotel – a small tea shop in Surjani Town – confirm hearing frequent gunfire. That these sounds originate from a shooting exchange between the law enforcement agencies and the criminals only becomes known later when the local residents watch television news channels or read newspapers. In almost all such “encounters”, no one from the law enforcement agencies even gets hurt whereas those on the other side almost always get killed. Encounters are not just deadly. Sometimes they can be transformative. They can make pious preachers out of illiterate day labourers — and enemies out of co-workers. Hakimullah is a native of Makeen town of South Waziristan tribal area which was the principal seat of the Tehreek-e-Taliban Pakistan (TTP) between 2007 and 2010. After failing to find a job in his hometown, sometime in 2011, he contacted Amir Mohammad whose family, too, came from Makeen but had shifted to Karachi decades ago. Mohammad invited Hakimullah to come over to the city and join as a commission agent at his tyre selling shop on Mauripur Road. Sitting in a non-descript tea shop in Mawach Goth near Karachi’s SITE area, Hakimullah vividly remembers what happened on December 30, 2014. It was around 9 am, he says, and shops had just opened at the New Mauripur truck stand. A white car, followed by a police van, suddenly stopped in front of a tyre shop ran by Mohammad’s cousin Gul Pir. “The two vehicles did not have any registration numbers,” Hakimullah recalls. As soon as the occupants of the car and the van – most of them in plainclothes but some also in police uniform – got out, they started pushing and dragging Hakimullah. “I was blindfolded and stuffed in the middle of the car’s backseat. Two people sat beside me. Somebody in the front seat was constantly talking on a phone, providing live updates. He was mentioning me as a bakra (goat),” Hakimullah tells the Herald. Mohammad and Pir were also arrested in the same raid. In an almost simultaneous but separate operation at Karachi’s fruit and vegetable market, the law enforcers nabbed another person, Noor Alam, who happened to be a cousin to both Mohammad and Pir. Hakimullah remembers being in the moving car for a couple of hours. After it stopped, he was taken out and pushed into a small high-roof room with only one door and no windows. His captors fed him well over the next two days and did not ask any questions. On the third night, four men came into his room and started beating him without uttering a word. “Then they blindfolded me again and put me in a vehicle. As we started moving, one of them told me that I was going to be killed soon. But they brought me back after moving me around for several hours,” recalls Hakimullah. Hakimullah does not remember having signed a confessional statement. “I was in such a mental condition that I now don’t recall whether I signed any papers or if I recorded any statement,” he says. The fact that he was released suggests that he must have made some kind of a confession. At least this is what the families of Pir, Mohammad and Noor Alam believe. The three were killed in an alleged encounter with the police and the rangers on January 7, 2015 — a week after they were picked up from their places of work. Sher Alam says his family has nothing to do with the TTP. His father and his paternal uncles settled in Karachi more than four decades ago and his brothers and all their cousins, except Pir, were born and married in Karachi. “My father and his brothers even sold their ancestral lands and homes in South Waziristan,” he says, “though some of our relatives still live there”. One of the three cousins killed by the police is said to be almost blind. “Amir Mohammed had very poor eyesight and could only see from his left eye. He had his eyes operated on seven or eight times but was still losing his vision rapidly,” says Sher Alam. The family, however, has a history of being on the wrong side of the law enforcement agencies. In 2006, police in Hyderabad detained Noor Alam when he was visiting that city on a business trip. “They demanded 300,000 rupees for his release,” says Sher Alam. He, instead, approached the Sindh High Court (SHC) for his brother’s release. When inquired by the court, the police claimed that Noor Alam was arrested for possessing illegal weapons. “The court acquitted him,” says Sher Alam. Mohammed’s brother Jamshed Khan was also arrested twice in 2008. On both occasions, he was released on the intervention of the high court without getting charged for any crime, says Sher Alam. When his brother and cousins disappeared into the custody of the law enforcement agencies late last year, Sher Alam moved the court once again expecting a similar outcome. Before the case could come up for hearing, however, the police claimed killing the three in an encounter. Khurram Waris, then a Senior Superintendent of Police (SSP) at the Crime Investigation Department (CID), told the press that the three were senior TTP members and were involved in a number of bank robberies and multiple cases of kidnapping for ransom. Similar fatalism has made 30-something Hakimullah to all but give up on a worldly lifestyle. Having refused to get married, he has devoted his life to preaching. Always clad in a white shalwar kameez and a waistcoat – with a white prayer cap permanently perched on his head – he does not keep contact even with his family back in South Waziristan and does only odd jobs, such as selling prayer caps, to sustain himself. “I want to spend the rest of my life the same way,” he says. Change does not always result in its desired outcome. What happens before the change, more often than not, ends up determining what will come after it — sometimes with unexpected twists. When Muhammad Nadeem got married sometime during the 2000s, he thought he could leave his days as a member of the banned Sipah-e-Sahaba Pakistan behind him. He started working as an electrician in an effort to lead a peaceful family life without having to bother about other people’s religious beliefs. On January 19, 2015 all his hopes and dreams came to a deadly naught. On that day, Nadeem was intercepted by four armed men in plainclothes as he came out of Farooqia Masjid located in Sector 5/F in New Karachi, after Isha prayers. The men also stopped two others – Adnan and Salman – along with him. The three were told to identify themselves and after they confirmed who they were, they were ushered into a police van waiting close by. Many people had by then gathered outside the mosque and they saw the whole incident take place, says Nadeem’s brother, Muhammad Waqar. Over the next two days, Waqar and his cousins frantically called all the police stations in district Central, only to be told that the police had no knowledge of Nadeem’s whereabouts — as well as of others taken away with him. On January 21, somebody told Waqar that a neighbourhood daily newspaper, Janbaz, had carried pictures of two bandits reportedly killed in an encounter with the police the previous night — one of the alleged bandits resembled Nadeem. “It was his photo,” says Waqar. He rushed to the morgue to identify and receive his brother’s body. The police claimed to have killed Nadeem in an exchange of gunfire during random checking. He is reported to be riding a motorcycle with someone else when officials of the Shahrah-e-Noorjehan Police Station told the two to stop. According to the police, they started firing at the policemen and tried to flee. The policemen claimed to have returned the fire, killing the motorcyclists on the spot. The identity of the other person killed with Nadeem is still not known. What happened between Nadeem’s arrest and his death remains a mystery. What is even more incomprehensible is how he was portrayed to be a robber before his death, as opposed to the sectarian fanatic, nabbed from a mosque for involvement in religious violence. There is another – and perhaps bigger – mystery around the case. Adnan and Salman, held along with Nadeem, remain missing even now. Someone going missing seems like a swift act. In one moment they are there – with their families, riding a vehicle, shopping somewhere, praying, having fun with friends, working in an office or perhaps committing a crime, even clashing with law enforcement agencies – and in the next moment they are gone like they never existed. It is in the small gap between the two moments that mysteries arise, that the details of disappearances become blurred. Dr Ghous Muhammad is an earnest old man assigned the task of training a spotlight on some of those dim details. He gets upset if people do not stick to their appointments with him and is a stickler for rules and regulations. Staying religiously away from the media’s radar, he has served at some key judicial posts. He retired as an SHC judge in 2000 and has worked as the chief of an official tribunal set up in 2007 to probe two suicide blasts at a comeback rally by former Prime Minister Benazir Bhutto on October 18 that year. Since October 2014, he has been a member of the Commission of Inquiry on Enforced Disappearances, set up under orders from the Supreme Court of Pakistan (SC) after the number of people going missing rose alarmingly between 2007 and 2010. “The commission receives complaints from all over Pakistan,” says Muhammad in an interview he agreed to give strictly on the condition that he will not speak about anything but the procedures followed to trace missing people. He says the commission does not conduct separate hearings on individual cases. Cases of similar nature – or those originating from the same area – are bunched together and are taken up for hearing simultaneously. High-ranking officers from the Inter Services Intelligence (ISI), Military Intelligence (MI), Intelligence Bureau (IB), intelligence wing of the rangers and a police officer not below the rank of an additional inspector general are always present during every hearing conducted by the commission. “I ask the complainants about the circumstances in which their relatives have disappeared,” says Muhammad as he explains the commission’s procedure. A list of missing people is then given to the representatives of each agency and the police to check if they are in official custody anywhere in the country. The officials are also told to check if the missing person is being held at the army-run internment centres in Khyber Pakhtunkhwa and the tribal areas. “The commission, however, does not [have the mandate to] seek details of any cases registered against the [missing] person. [Our] mandate is limited to tracing the disappeared,” says Muhammad. According to the latest report released by the commission early this year, cases of 186 missing people in Sindh, including Karachi, are still pending before it. If all agencies report that the missing person is not in their custody, the commission then asks the police to check with the Edhi Foundation and hospitals if they have any information about him. The police are also told to inquire from the foreign ministry if the missing person has shifted outside Pakistan. When these efforts fail to yield results, the commission has the authority to set up a Joint Investigation Team (JIT) to find out if the missing person disappeared voluntarily or whether his disappearance was enforced by the security and intelligence agencies. The JIT also looks into the possibility of someone having gone missing due to some personal enmity or in a criminal incident. If this team does not reach a conclusion, a second JIT is formed to perform the same tasks all over again — and then a third one. The second last step in this process is the constitution of a provincial task force to make special efforts at the highest administrative level, in a province, to trace the missing person. Provided nothing else works, explains Muhammad, all the three members of the Commission of Inquiry on Enforced Disappearances then jointly conduct investigations on their own. According to the latest report released by the commission early this year, cases of 186 missing people in Sindh, including Karachi, are still pending before it. When asked what the commission’s standard operating procedure is if and when a missing person is found to have been killed in a genuine or staged encounter, Muhammad responds in a non-emotional tone: “On our record, he becomes traced”. A missing person traced as dead offers no consolation to those he leaves behind. All to little avail. Their only achievement had more symbolic value than any practical utility. After Anees’s family held protests outside the Parliament House in Islamabad in 1997, the Senate formed a committee to discuss the phenomenon of missing persons. The committee, however, did not have the power to investigate individual cases, let alone determine who and what made people go missing. Somewhere in the early 2000s, the federal government announced that Gohar was released after three years of detention. This, of course, was not true since he never returned home. “In 2007, I filed a petition in the SC seeking to know the whereabouts of my brother,” says Baber. The final ruling on the petition is still pending after all these years. The United Nations (UN), in the meanwhile, took note of Baber’s long struggle for the recovery of his brother. The UN officials first contacted him in 2005 while he was busy protesting against the false announcement by the federal government about his brother’s release. They wanted to know about the circumstances in which Gohar had gone missing. Since then, Baber has attended many UN-convened events on the issue of missing persons. In most cases, the families of those who die in alleged encounters do not know exactly who arrested and killed them. 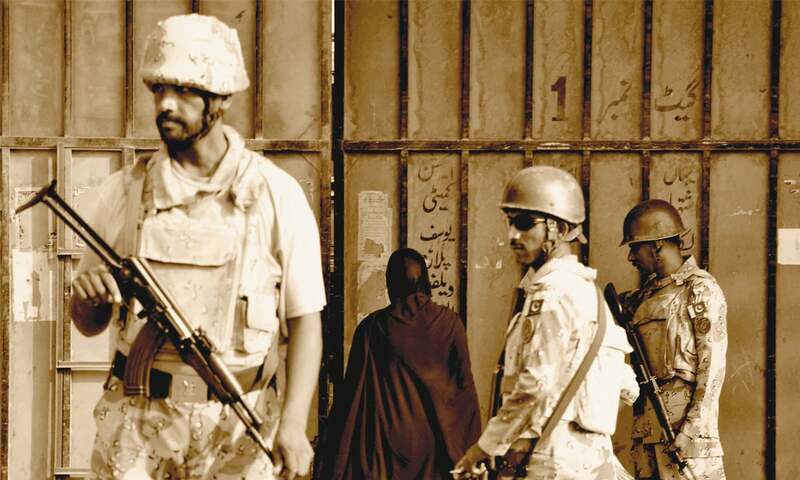 In 2012, the Geneva-based UN committee on enforced disappearances visited Pakistan. The members of the committee also met Baber in Islamabad and invited him to attend a UN conference scheduled for September 15, 2014 in Geneva. Three days before the conference, he was picked up by what he calls the officials of intelligence agencies. They told him not to attend the conference as his participation in it would give Pakistan a bad name. When he refused to oblige, he was kept in detention for two weeks and was released only after the conference was over. Sporting a long white beard and always clad in a white shalwar kameez with a prayer cap on his head, Baber looks more like the member of some orthodox religious order than a political activist. Moved by his own suffering, he has been following the court cases of other missing persons belonging to various religious and political groups and parties. He explains in detail how the officials of security and intelligence agencies manage to delay judicial proceedings in such cases – sometimes for years – taking advantage of flaws in laws and legal and administrative procedures. In a number of cases, the missing persons never get traced – as is the case with his brother. Others return home as corpses, sometimes mutilated and in most cases riddled with bullets. They are either found dead at deserted places or have lost their lives in alleged encounters. In most cases, the families of those who die in alleged encounters do not know exactly who arrested and killed them. And when they do know that, they deem it expedient to not talk about it in public. Maimoona, an old woman hailing from Godhra Colony in New Karachi, cannot care less about the consequences of speaking out. Why should she, she asks. She, after all, saw her son, Muhammad Ilyas, disappear into the custody of a security agency only to receive him back dead. Maimoona does not mince her words when she accuses the Sindh Rangers of kidnapping his son and subjecting him to severe torture before killing him in custody. Sitting in her small house, she recounts what transpired on February 8, 2015. “It was a Sunday and Ilyas’s children wanted to go to Seaview,” she says. Ilyas, on the other hand, wanted to be at the wedding of his friend’s daughter. The children then asked him to get some haleem for them to eat. He agreed and left home, on his motorcycle, for a local eatery. As he was buying haleem, Maimoona claims, the rangers arrested him “in the presence of shopkeepers and several passersby”. They also took his motorcycle with them, she adds. When her relatives and members of her Godhra community visited the nearby office of the Sindh Rangers in New Karachi the same night, the men deputed at the reception checked their records and confirmed that Ilyas had been taken inside. They also advised the aggrieved family to return in the morning. Next day, a new set of officials was working at the reception and they strongly denied finding any entry about Ilyas’s presence inside the office. When Maimoona’s other son, Mohammad Shahid, filed a petition in the SHC seeking his brother’s whereabouts, the government lawyers stated that no law enforcement or intelligence agency had detained or arrested Ilyas. A few days later, Maimoona somehow found out that her son was being detained at the rangers office in Nazimabad. “When I went there, officials told me that Ilyas had been put under detention for three months. They advised me to wait and refrain from publicly raising the issue of his disappearance before the expiry of the detention period,” she tells the Herald. Three months later, she visited the Nazimabad office again. She was told that the detention period was not over yet according to the official calculation. Another few weeks passed. One day someone informed Maimoona that news channels were showing Ilyas’s photo, calling him a member of Baba Ladla group of Lyari gangsters. According to a news report accompanying the photo, he was killed in a joint action by the police and the rangers in Lyari’s Chakiwara area. Maimoona was shocked. “He was born in Godhra Colony and he spent all his life there. 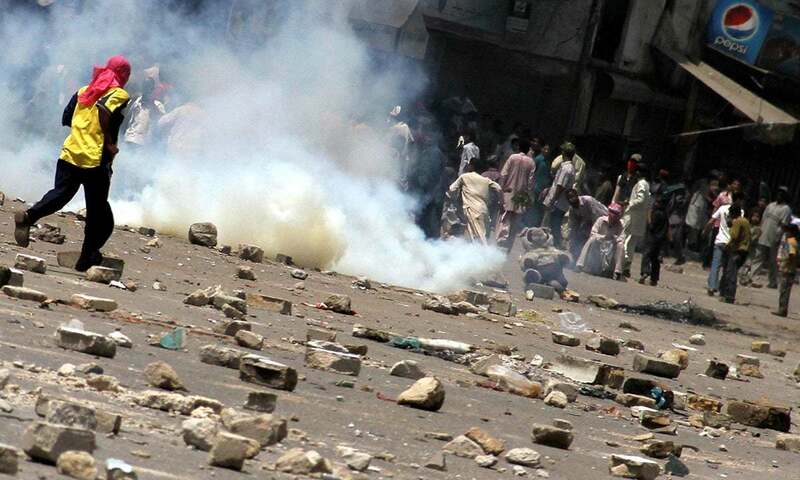 He had nothing to do with Lyari and its gangs,” she protests. When she saw Ilyas’s body before his burial, she claims having noticed torture marks. His left arm and hand were both disjointed, she says. Habeas corpus – Latin for “you have the body” – is, according to the Oxford Dictionary, a writ requiring a person under arrest to be brought before a judge or into court, and to secure the person’s release unless lawful grounds are shown for their detention. Starting in April this year, three families from Karachi’s Korangi area filed habeas corpus writs in the SHC for the recovery and release of their missing family members — Muhammad Adeel, Zohaibullah and Muhammad Shahid. The three were MQM activists in adjacent localities in Korangi and were picked up from different locations and under different circumstances, on April 1, May 21 and August 6 respectively. Before the court could issue any orders on the writs, the families had the bodies back — lifeless. On September 11, 2015, a spokesperson of the Sindh Rangers issued a press statement announcing the killing of four terrorists in an encounter in Gulshan-e-Maymar neighbourhood near northern bypass. According to the spokesperson, the rangers received information that the terrorists involved in the March 4, 2015 killing of lawyer Husnain Bukhari were hiding somewhere inside Gulshan-e-Maymar. When the security officials started cordoning off the area, the terrorists are said to have opened fire, injuring a rangers man. The rangers then returned the fire, according to the spokesperson, and killed the terrorists who could not be identified immediately. Next day, Dr Farooq Sattar, a senior MQM leader, held a press conference and revealed the identities of those killed as Adeel, Zohaibullah, Shahid and Muhammad Kashif. He said the four were “extrajudicially” killed by the rangers. Most law enforcement officials feel encounter killings are a necessary evil because it is almost impossible to prosecute and punish even the known enemies of the state through normal legal channels. They were among 150 MQM activists who have disappeared in recent months and a list containing their names as missing people was presented to Prime Minister Nawaz Sharif much before their killings, Sattar said. The copies of the list were also sent to Sindh Chief Minister Qaim Ali Shah and director general of the Sindh Rangers Major General Bilal Akbar, he added. Hours after Sattar’s press conference, the rangers spokesperson issued another statement, calling MQM’s allegations of extrajudicial killings as baseless propaganda. He then added that the four people killed in the encounter were not just responsible for Bukhari’s murder but had also killed several police officials. The rangers have shown no proof to substantiate these claims. Party insiders say the four were killed because a police official, who happens to be Bukhari’s brother, harboured a personal grudge against them. A senior MQM official from Korangi tells the Herald that Adeel, Zohaibullah, Shahid and Kashif had called Bukhari to a party office, and asked him for help in the release of party workers arrested by his brother about two and a half years ago. Though the lawyer later joined MQM’s legal aid committee, his brother continued believing he was coerced into doing so, the MQM activist says. That, he claims, is the reason why the four have been killed. According to Syed Aminul Haq, twice elected to the National Assembly on an MQM ticket from Karachi’s district East, these killings are part of a larger pattern of persecution his party is facing. Fifty MQM workers have been killed extrajudicially since the start of a security operation in Karachi in November 2013, he says. “The bodies of many were dumped [at deserted places] after they had died in the custody of law enforcement agencies; others were killed in fake encounters,” he tells the Herald in an interview. Haq is visibly angry at what he calls the brutal treatment of his party’s members. “Were these MQM workers fugitives of law or had the courts declared them absconders?” he says. Only by claiming that they were involved in criminal activities, Haq says, the law enforcement agencies cannot call them “suspects”, let alone kill them in staged encounters. No one becomes a suspect unless a case is registered against them somewhere in the country and no one should be punished unless charges against them are proven in a court of law, he argues. Most law enforcement officials feel encounter killings are a necessary evil because it is almost impossible to prosecute and punish even the known enemies of the state through normal legal channels. Others are just trigger happy — and some of them have climbed the career ladder by shooting their way up. On a March morning in 1994, a police inspector was having a nap on one of the back benches in court room number one on the second floor of the SHC — this is where the chief justice of the province, its highest judicial official, sits in the middle chair to adjudicate and dispense justice. Soon a court official called out the inspector’s name — Anwar Ahmed. Woken up from his slumber, he was told to present himself in front of a two-member bench of the court headed by then Sindh Chief Justice Nasir Aslam Zahid. Arif Memon, a resident of Karachi’s Kharadar area, had moved the court against Ahmed claiming that the police official had detained his brother without registering any case against him. 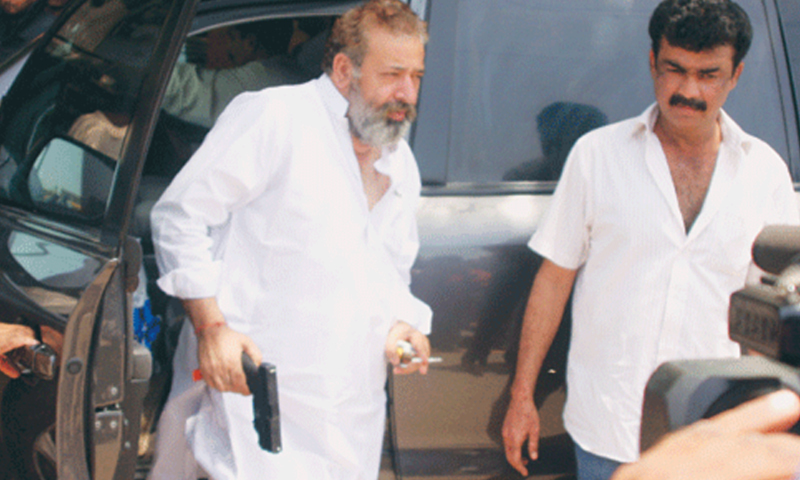 Memon also contended that the inspector had disregarded a court order for the release of his brother. After the judges had heard the arguments in the case, they reprimanded Ahmed for disobeying the court’s orders for the release of the man he had detained without fulfilling legal procedures. They also recommended a departmental inquiry and disciplinary action against him. The inspector of those yesteryears is now an SSP posted in Malir district. Going by nom de guerre Rao Anwar, he is a feared police officer who has made a name for himself as an encounter specialist. Recruited in the police in 1980 as an assistant sub-inspector, he first displayed his readiness – and skills – during the 1990s to get rid of alleged criminals and perceived anti-state elements without bothering about court trials. Then working under Inspector Bahadur Ali, who was also known for his enthusiasm for encounter killings, Ahmed became famous for having arrested and killed a number of MQM activists during the different phases of a security operation in Karachi that started in 1992 and ended in 1999. A public craving for peace and order has developed zero tolerance for the decidedly lengthy, often circuitous and almost always flawed procedures and processes for addressing the twin problems of crime and punishment. When MQM came into power after the 2002 general election, Ahmed had himself transferred to Balochistan fearing retaliation. In 2008, he returned to Sindh after Pakistan Peoples Party (PPP) had formed governments both in the Centre and in the province. Said to be close to some senior PPP leaders, Ahmed was soon promoted as a Deputy Superintendent of Police (DSP) and then as an SSP. On April 30, 2015, he held a press conference that openly disregarded the PPP’s reconciliation policy towards the MQM. On the basis of what he claimed were confessional statements of two alleged MQM workers, he told the media that the party had been sending its activists to India for training by Indian intelligence agency, the Research and Analysis Wing (RAW). He also went beyond his official mandate by recommending that MQM be banned as a terrorist organisation. His utterances fit well into the narrative being disseminated and promoted by the intelligence and security agencies about Indian involvement in violence in Pakistan, in general, and in Karachi, in particular. This suggests that he knows which way the political wind is blowing and which players on the political and administrative chessboard can guarantee him the security he needs. PPP, certainly, is no longer that player. In his interactions with the media in recent months, Ahmed has made a staggering claim: He says he and his police team have killed 50 people in encounters just in six months between October 2014 and April 2015. One Rana Faizul Hasan of the United Human Rights Commission Pakistan moved the SHC earlier this year to institute a panel of inquiry to probe if all those encounters were genuine. The petitioner attached newspaper clippings and audio recordings of Ahmed’s press conferences as supporting documents with his petition. On September 23, 2015, the court rejected the petition on technical grounds. There is a ring of illegality to the very word encounter. In both India and Pakistan, it is mostly used to describe extrajudicial killings by the police or other law enforcement agencies. These encounters could be either staged or fake, says Dr Fateh Muhammad Burfat, chairman of the department of criminology at the Karachi University. 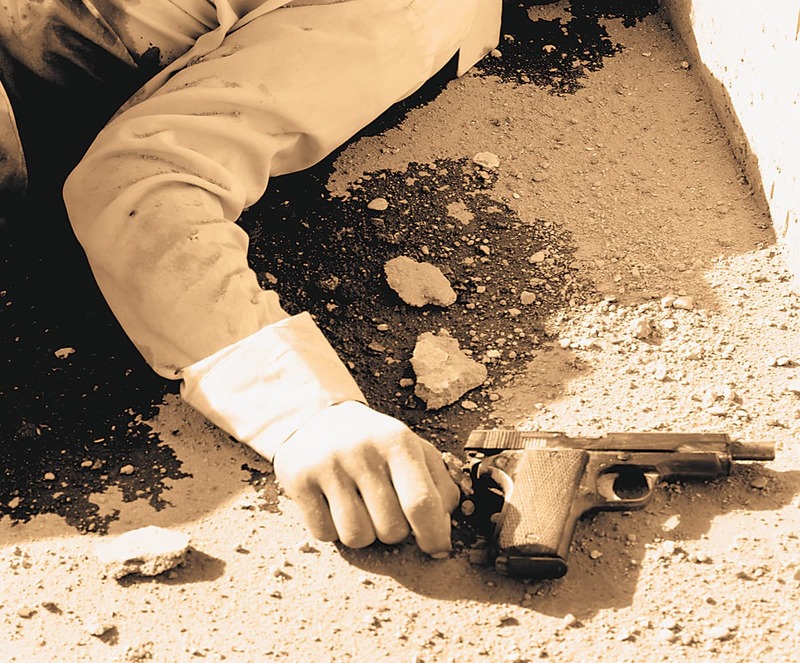 In a staged encounter, the law enforcers take arrested suspects to a particular place and shoot them there; fake encounters are used to justify killings by security and police officials in cases of street shooting of people who, for instance, fail to stop at a checkpoint or who come under official fire simply by being at the wrong place at the wrong time. Mostly, says Burfat, the law enforcers claim to have resorted to encounter killings in self-defence. The Indian Supreme Court has been grappling recently with questions about the legality of encounter killings. Hearing a case commonly known as People’s Union for Civil Liberties versus State of Maharashtra, the court has been examining various aspects of the phenomenon in order to check unlawful resort to it. The case was originally heard by the Bombay High Court which issued an elaborate set of guidelines to determine if an encounter was genuine and how police officials could be discouraged from resorting to encounter killings. The parties to the case, however, were not satisfied with those guidelines and approached the Supreme Court to adjudicate on them. On September 23, 2014, after detailed hearings, a two-member bench of the Indian Supreme Court, headed by Chief Justice R M Lodha, recommended an elaborate procedure to be followed before, during and after those law enforcement operations which have the possibility of turning into encounters. The court ordered that a First Information Report (FIR) “shall be registered” when an “encounter takes place and firearm is used by the police party and as a result of that, death occurs”. The FIR shall also “be forwarded to the court…without any delay”. Most, importantly, the judges ruled that an “independent investigation into the incident/encounter shall be conducted” – by the CID or senior police officials – and the “team conducting inquiry/investigation shall, at a minimum, seek” to identify the victim(s), to recover and preserve evidence, to identify witnesses (including police personnel involved) and to determine the cause, manner, location and time of death in an encounter. Similarly, a magisterial inquiry “must invariably be held in all cases of death which occur in the course of police firing and a report thereof must be sent to a Judicial Magistrate”. In other significant parts of the ruling, the court directed the government to ensure chemical analysis of the fingerprints of the person(s) killed in an encounter, a video recording of their autopsy and preservation of “any evidence of weapons, such as guns, projectiles, bullets and cartridge cases”. The court also ruled that in the case of someone’s death in an encounter, “the next of kin of the alleged criminal/victim must be informed at the earliest”. As far as action against officials involved in a staged or fake encounter is concerned, the court directed the government that “disciplinary action against such officer must be promptly initiated” and they should “be placed under suspension”. The judges further ordered that “no out-of-turn promotion or instant gallantry rewards shall be bestowed on the concerned officers soon after the occurrence [of an encounter]” and that all “rewards are given/recommended only when the gallantry of the concerned officers is established beyond doubt”. Meanwhile in Pakistan, encounters are seldom, if at all, probed even though legal provisions do exist for the purpose. “If the relative(s) of the person(s) killed in an encounter believe that the encounter was fake or staged, they can approach a district judge for the registration of an FIR under section 22 of the Criminal Procedure Code (CrPC) against the concerned police personnel or those from the other law enforcement agencies exercising police powers,” explains Mahmood Alam Rizvi, a former judge of the SHC. These provisions look robust — if implemented, that is. 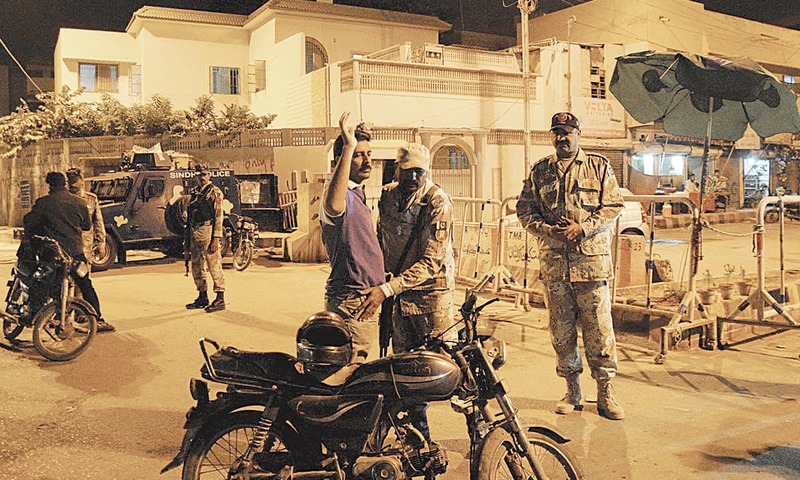 Buttress them with the directions issued by the Indian Supreme Court and the phenomenon of encounter killings is likely to recede, if not totally disappear, as a preferred mechanism for law enforcement in a city as strife-ridden as Karachi. That, however, is a tall order. A public craving for peace and order has developed zero tolerance for the decidedly lengthy, often circuitous and almost always flawed procedures and processes for addressing the twin problems of crime and punishment. And law enforcement agencies take active pride in their ability to cull the perceived bad eggs without having to put them through a long and leaky judicial process. Karachi has been here before. Between 1993 and 1999, the security agencies, including the police and the rangers, tried doing something similar to what they are doing now. 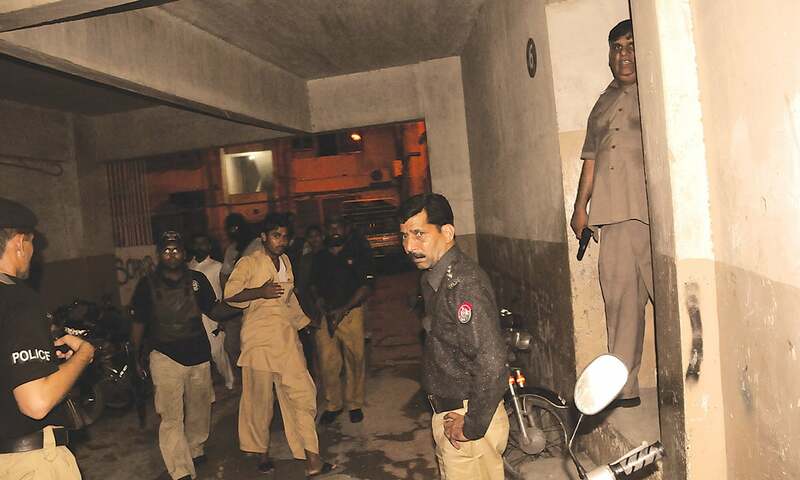 While not a single inquiry, whether by the police or the judiciary, has been conducted into the nearly 1000 encounter killings that have happened in Karachi over the past two years, the law enforcement agencies are patting themselves on the back for bringing down the crime rate in the city mainly through encounter killings. Instant rewards are being given to those who have taken part in some of these killings. Only last month, Sindh Police chief Ghulam Haider Jamali gave away 500,000 rupees to a team of officials working at the Counter-Terrorism Department for taking part in an encounter that resulted in the death of two wanted TTP militants in Ittehad Town area. Similarly, when officials posted at the Shahrah-e-Noorjehan Police Station killed an alleged robber Sadiq in an encounter in September 2014, their seniors promptly rewarded them with cash payments. Inspector General Sindh Police Jamali also bestowed cash awards on six officials posted at the New Karachi Police Station on March 3, 2014 for the encounter killing of two alleged target killers. Many among us believe the police and the rangers are doing the right thing: encounter killings are the only possible solution to Karachi’s massive law and order problems which, essentially, arise from the deadly scramble among criminal and terrorist gangs trying to take over the city — kidnapping, robbing, shooting and killing ordinary citizens at will in the process. This view justifies celebrating encounter killings, regardless of whether the shootouts are genuine or fake. Its proponents also deem it important that security officials involved in ridding the city of crime and criminals are rewarded for their daring acts of taking the gangsters and terrorists head on: these rewards will raise their morale and keep them interested in their jobs. When authorities in another city adopted a similar approach – and the citizens there endorsed that approach – the outcome was not entirely positive. After Bombay experienced serious communal violence, including bomb blasts, mob attacks and targeted killings, in the wake of the demolition of the Babri Masjid in 1992, the local police there set up multiple squads that specialised in encounter killings. The crime rate in Bombay – now called Mumbai – hardly abated. Criminal gangs shifted their command and control centres elsewhere but their local minions continued to carry out all kinds of illegal activities – from gun running to drug smuggling and from shooting rivals to extorting money from businesses — often in connivance with law enforcement officials. Even incidents of terrorism have not stopped: between 2006 and 2008, Mumbai suffered two massive hits by terrorists – bigger than any incident of terrorism anywhere else in India in recent years – resulting in the loss of hundreds of lives. And Karachi, too, has been here before. Between 1993 and 1999, the security agencies, including the police and the rangers, tried doing something similar to what they are doing now. They targeted a political party, accusing it of running criminal rackets in the city and carrying out an Indian conspiracy to break up Pakistan. The law enforcement agencies detained thousands of activists of the party and killed hundreds of them in alleged encounters. Do we remember what happened next? The same party came to power in the 2000s, both in Karachi and Islamabad, while the country was being run directly by the security agencies under a military ruler. This was originally published in Herald's October 2015 issue. To read more, subscribe to Herald in print. When and by whom was "Yousuf Plaza" shifted to Shahrah-e-Faisal? So this is all staged to show N-League has finally achieved peace in Karachi while their relation with 'ghunda' parties are still good and intact. @Failed Fisherman Thanks for your comment, the caption has been updated. Also tell how target killers/criminals killed innocent people without any fear of the law before the Karachi operation. Correct the judicial system and there will be no encounters. Excellent article with detailed facts. Peace cannot be sustained with such barbaric tactics. This is an eye-opener to those who think MQM is the only 'ghunda party' in Karachi. Unfortunately the psyche in our country has been to question the law enforcers rather than the crime. There is definitely in part the inability and corruption of the police as well that raises such questions but I believe that law enforcing agencies have done a good job in Karachi and it is quite evident as well. 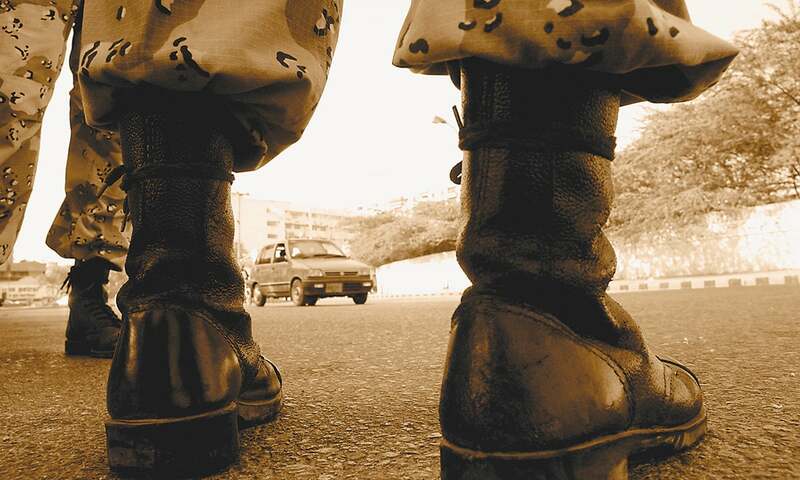 Now mentioning the corrupt acts or fake encounters in conjunction with the whole Karachi operation raises doubts in the minds of public and undermines the achievements for bringing peace in the city, which is far from truth as we all as citizens of Karachi can see and feel the benefits of this operation. One can always count on the Herald to take an anti army and Rangers roll. Love the one sidedness of the article. Does not explain the 70 per cent crime drop in the city. Does not provide any insight into maybe investigating the so-called cases other than hearsay of the criminals' families who have directly or indirectly benefited/profited from their criminal enterprises. No mother or brother will ever say her son was a murderer or a terrorist. The whole article has provided no evidence but is entirely based on hearsay! Increase in economic activity in Mumbai and jobs has reduced the criminal elements. As business and local economy requires, security to flourishes -- interests of security and political masters have now changed in Mumbai. Its underworld is no where close to what is was from 1950s to 1990s. Economics not encounters is the solution. This is not a surprising for me. This has been happening for so long, even in 1990's operation clean up, many men and young boys who had nothing to do with any political parties were apprehended illegally by police and agencies. Those whose families paid the amount asked by them were emancipated, otherwise they were handicapped or killed. Do not blame the Rangers without any proof to help the enemies of Karachi. It's a shame that the state is sponsoring killing of innocent people just to fake the prevalence of law and order. With 1/3rd of our budget spent only on defence, is this the best we can do? You can wait for justice in Pakistan, Rangers have to take some action. The cancer is so widespread. Funny. Great article, funny and informative. Haven't heard of any innocent being killed in the encounters. Obviously criminals have families, brother and mother etc. who are not aware of the heinous acts being committed by these criminals which doesn't make them less culprit. Having spent 28 years of my own life in Karachi and seeing all my cousins and elders safe.... never even inquired by any law enforcement agency despite having political followings and support on social media.. I can safely say that no innocent person is killed by rangers. Police though commit crimes on behest of politicians or others but Rangers just don't. it appears like a lawless nation. It's no wonder that the world says it's a failed state. I feel sorry for the loss of innocent lives, however the Rangers and Police must be doing something right that has reduced the crime in Karachi by 70% within a year! This report has been written based on just one angle that law enforcers are wicked and tormentors, and act without any regard to standard procedures; the captors and criminals are just innocent people. The story does not point towards any solution to curb or control lawlessness and killings by the terrorists, extremists and religious fanatics, and without accepting that a political party has been responsible for mayhem in Karachi since its inception. Unless the criminal justice system is overhauled and effective, when judges are made responsible, honest and just, how can you except that law enforcers will act like those in western countries? Even western countries' cases come to light when law enforcers, because of difficult circumstances, act like those in Pakistan. 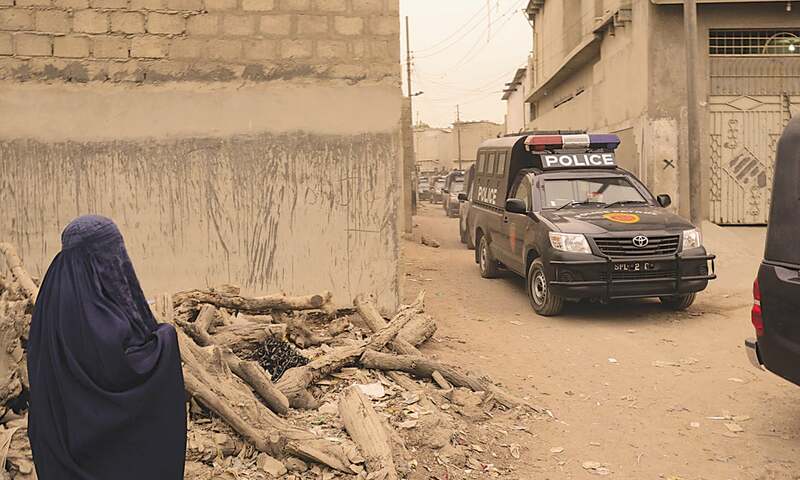 The only long-term solution to Karachi's law and order problem is having a local police that is depoliticized, well-trained and well-staffed, comprises of local recruits and has a stake in Karachi's population. And for such a police to function effectively you need a locally elected municipal government and empowered district courts with solid witness protection programs. 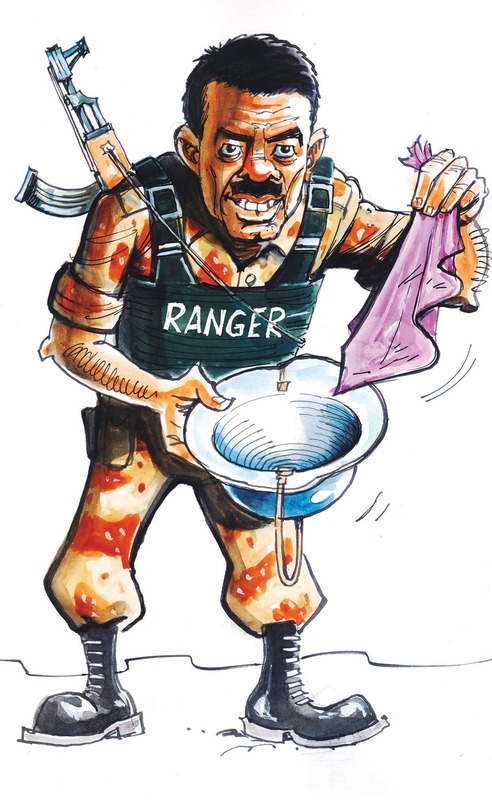 The Rangers are in a good position to restructure Karachi's police force now, otherwise it's only a matter of time before these encounters are revealed for what they mostly are (face-saving killings of low-value targets), which would embolden the hardened criminals who should actually be targeted and then they will go back to causing mayhem again. Why the past tense?? Has the killing stopped?? The question is that what do the security forces get by killing innocent people? This 'psyche' has been inculcated through 60 years of social experience, it reflects the reality. First of all it is not 70%, there is some drop because only one ethnicity is being killed. @Afghan agree with you 100%. I also agree that with Rangers Karachi is much safer as it used to be but on the same token killing innocent people without any credible evidence is not something to be appreciated. The irony is when suspects are arrested they make 'V" signs and the media publishes it. basically people/the youth living in all these areas have no future, the elected representatives just failed to give hope.. so point out faults of these big fishes too who are living in Dubai or London. That is why we need good Intelligence agencies that can penetrate these terrorist gangs, once identified none of the terrorists should be taken alive as the civil courts will grant them bail the next day. Very long but depicts corrupt, inefficient and poster-boy Rangers, police and army involvement. They are creating a bigger problem, a large army of angry families, a dynamite that will explode, silent suffering but voting against the ruling party and in some cases resulting in revenge killings. @jerseyb How do you know that the real criminals have not gone into hiding? They have the resources and wherewithal to do that. After the rangers move out, I am sure these will crawl out of holes and start their work again. Can Herald please also write about the victims of the crime in Karachi in the last two decades? Especially how the MQM and other partys' workers are killed by the dozen every day? Only then I would take this article any seriously. If the encounters are resulting in 70% reduction in crimes, then I will take them any day. The law enforcement agencies/people are no less than criminals. Look at Pakistan's history, Federal bureaucrats/officials in Islamabad are not sincere to the people, this tactic of controlling Pakistan from a distance that is the capital Islamabad, and not letting local administration deal with the situation has resulted in a situation which now is uncontrollable by either Federal or Provincial agencies. Arresting people and forcing them to admit what they have not done has become tactic used by Islamabad. The police and rangers should be held accountable and investigated when they kill people in false encounters. How many police men kill innocent people just to settle a vendetta or are paid to do so? Fix the judiciary and police, a lot of problems will be fixed automatically. The idea of encounter killing is a result of criminals being freed by courts. In ineptness and incompetence of these two institutions is the main reason why rangers and armymen are needed during the testing times. Senator Farhatullah Babar stated that the slogan of accountability will sound hollow without across the board accountability of every one by rejecting the notion of ‘holy cows’ whether in the security establishment or in the judiciary and without an effective Right to Information (RTI) law. The process of accountability must start from the judiciary. If judiciary is performing 99% every thing will take its right place. Once Winston Churchill is reported to have asked: "Are the courts dispensing justice?" After receiving an answer in affirmative he said: "fine, then no nation can defeat Great Britain." Until this happens the Rangers must kill the terrorists when in found in action. When bulls fight, crops suffer. It takes only one rotten fish to make the whole pond dirty. All the good work of law enforcement agencies are worthless if the lives of innocent civilians are at stake. It will come to haunt them. This is what the Army thought in East Pakistan on March 25th 1971. A clean up operation in our area was conducted,some were picked up and later found dead, one of them I personally knew was warned twice not to come back to our area, third time he was picked up from our area and found tortured and killed. His family called him shaheed and innocent, he also prayed five times a day but was involved in extortion and other crimes. The point I would like to make is that innocent hard working people like me are targeted by these criminal we cannot fulfil their absurd demands, nor can we fight them, so the agencies do a good job whatever it takes to protect us. Agencies are not stupid and pick up innocent people to kill, they target know criminals and I support their calculated decisions. LEAs are working hard and doing the best possible job, to keep the citizens safe from target killers and bhatta khors, under the limitations of an old, rickety, and outdated judicial system, where any witness to crime (including media itself) has frequently been intimidated into silence. See the result! Let us make LEAs job easy and let us, rather, criticise our civilian governments (including politicians) to start good governance and legislate well. Intense focus is required to speed up the prosecution and judicial process. Till then, Rangers Zindabad! I am so sorry to read this article. I was so sad about fate of all those 'innocent' humans whom Rangers and Police have killed away from the prying and watchful eyes of Human Rights Commission of Pakistan. As a result of these 'illegal' killings, Karachi has become a relatively safer place. Lots of gangsters have disappeared...either met their creator or fled to far off places. Crimes have reduced to almost 70 percent. But enemies of Pakistan are unhappy why these urban terrorists are being eliminated and cannot play havoc with daily lives of innocent Pakistanis. We, the residents of Karachi, know all this. But thank you for putting all this in writing, it is a great eye opener to rest of Pakistan. No journalist has the guts to write the names of murderers of thousand of people over the last many years and their party affiliations. They can only criticize the law enforcement agencies. Thanks for shedding light on this issue. Agree 100% that why were there no FIRs for all those killed in encounters? That only shows incompetent police work. To reduce lawlessness, we need to fix the judiciary to help expedite trials, executing people who were never accused or charged is simply wrong and it should not be celebrated. Can you please enlighten us about 30 black years of Karachi, Hijacked by so called political parties for monetary gains, killing thousands of innocents Pakistanis on name of politics,language & religion! @human rights Please tell that to the families of thousands of those who have died at the hands of target killers, bhattakhors and hardened criminals in Karachi, including those hiding behind the skirt of political parties. You live by the sword, you die by the sword. @Ali khan Neither have the law enforcement agencies provided any evidence.....it is just their word, which for general public is not reliable!! @Akber Rangers are not some divine institution which cannot commit blunders...if it hasn't happened with you it doesn't mean that it never happens to anyone. Open up your eyes if you are living in Karachi!